Hailed as a composer of music that is “smart, vital, and inventive” (Philadelphia Inquirer) Maggio has created an unusually diverse and substantial body of work. Each project creates a unique connection between Maggio’s “wondrously eclectic vocabulary” (New York Times) and a wide array of commissions, artist residencies, and interdisciplinary collaborations. “Lyrical, passionate, melodic, and rhythmically charged” (American Record Guide), Maggio’s music has been performed on concert stages, in orchestra pits, in school auditoriums, and at arts festivals around the world. With a firm belief that new music thrives when it takes root in an audience of passionate listeners, Maggio has been an artist in residence for school districts, arts councils, dance companies, community choirs and bands, and professional ensembles. Communities from Long Beach, California to Gettysburg, Pennsylvania, have commissioned Maggio to create new compositions that reflect their history, culture, and hopes for the future. A long-time member of the BMI Musical Theatre Workshop in New York City, Maggio collaborates regularly with writers including Michael Hollinger, Matthew Hardy, Justin Warner, Kristin Maloney, and Amy Buchwald. He has composed songs and incidental music for numerous professional theaters, including productions at Yale Repertory Theater, Philadelphia Theater Company, People’s Light and Theater Company, Pennsylvania Shakespeare Festival, and Shakespeare Santa Cruz. His music for theater has received several Barrymore Award nominations in Philadelphia, including his scores for The Laramie Project, The Merchant of Venice, M Butterfly, and The Outgoing Tide. Dance companies across the United States have commissioned Maggio for new scores, including collaborations with Pennsylvania Ballet, Ballet X, 10 Hairy Legs, Roxey Ballet, Stephen Pelton Dance Theater, Randy James Dance Works, and Leah Stein and Dancers. He was selected to participate in the month-long Young Choreographers and Composers Program at the American Dance Festival, which resulted in the creation and premiere of Barcarole with choreographer Stephen Pelton. 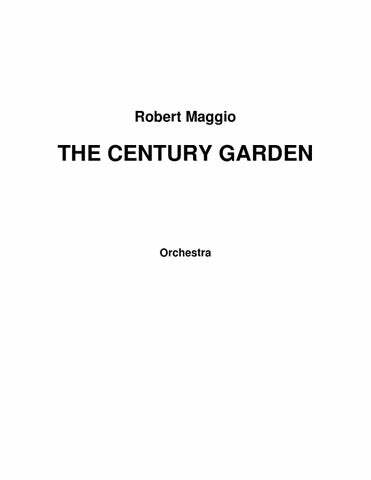 Orchestras have performed Maggio’s orchestral music across North America: including the Boston Pops, Atlanta Symphony, Philadelphia Orchestra, Cincinnati Symphony Orchestra, Long Beach Symphony, National Symphony Orchestra of Mexico, Oakland East Bay Symphony, Dallas/Fort Worth Symphony, Riverside Symphonia, New York Youth Symphony, Tampa Bay Youth Orchestra, and numerous university orchestras. His chamber and vocal/choral music has been performed by the Chamber Music Society of Lincoln Center, New York Festival of Song, Lincoln Center Out-of-Doors Festival, Borromeo String Quartet, Corigliano Quartet, American Brass Quintet, Serafin String Quartet, Colorado Quartet, baritone Sanford Sylvan, Detroit Chamber Winds, Meridian Arts Ensemble, Composers Inc., Network for New Music, Orchestra 2001, and the Choral Arts Society of Philadelphia. Maggio is the recipient of numerous honors and awards, including grants from the Guggenheim Foundation, the American Academy of Arts and Letters, the Pew Fellowships in the Arts, the American Composers Forum, the Pennsylvania Council on the Arts, the New Jersey State Council on the Arts, ASCAP, BMI, New Music USA, and Meet the Composer. A graduate of Yale University and the University of Pennsylvania, Robert Maggio lives with his family in Lambertville, New Jersey. He is a Professor and Chairman of the Department of Music Theory, History, and Composition at West Chester University’s School of Music in West Chester, PA.
13:00 2Ob. 2Cl. 2Bsn. 2Hn. 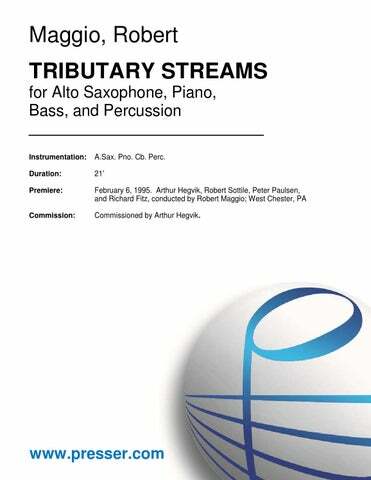 for Tenor and Orchestra 5:30 Tenor Solo; 2 2 2 2 – 2 2 0 0; Timp. Str. 12:00 S.A.Chorus; 2 2 2 2 – 4 2 2 0; Timp. 2Perc. Str. 32:00 3(Picc.) 3(E.H.) 3(EbCl./ B.Cl.) 3(Cbsn.) – 4 3 3 1; 3Perc. Pno.(Cel.) Hp. Str. Movement II from “Three Paintings from DOS VISIONES” 5:00 3(Picc.) 3(E.H.) 3(B.Cl.) 3(Cbsn.) – 4 3 3 1; Timp. 3Perc. Pno. Hp. Str. for Orchestra 12:00 2(dbl. Picc.) 2 2 2 – 4 3 3 1; Timp. 3Perc. Str. 5:30 2 2 2 2 – 4 3 3 1; Timp. 2Perc. Str. 8:00 2(Picc.) 2(E.H.) 2 2 – 2 2 0 0; Perc. Str. for Orchestra 10:00 3(Picc.) 3 3(E-fl Cl.) 3 – 4 3 3 1; Timp. 3Perc. Pno. Str. 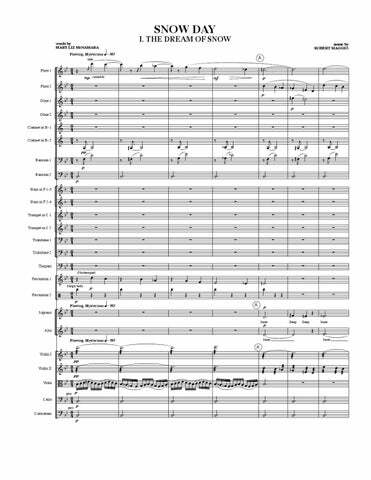 for Orchestra 34:00 3(Picc.) 3 3(B.Cl.) 3 – 4 3 3 1; Timp. 4Perc. Pno.(Cel.) Hp. Str. for Brass Choir and Percussion 12:00 4Tpt. 4Hn. 3Tbn. 2Bar. 2Tu. 3Perc. for Orchestra 9:00 3(Picc.) 3(E.H.) 3(B.CL.) 3(Cbsn.) – 4 3 3 1; Timp. 3Perc. Pno. Hp. Str. Movement III from “Three Paintings from DOS VISIONES” 8:00 3(Picc.) 3(E.H.) 3(B.Cl.) 3(Cbsn.) – 4 3 3 1; Timp. 3Perc. Pno. Hp. Str. 5:00 2 2 2 2 – 2 2 2(B.Tbn.) 0; Timp. Perc. Str. 8:00 3(Picc.) 3(E.H.) 3(B.Cl.) 3(Cbsn.) – 4 3 3 1; Timp. 3Perc. Pno. Hp. Str. 15:00 3(Picc.) 2 2 2 – 4 3 3 1; Timp. 3Perc. Hp. Str. 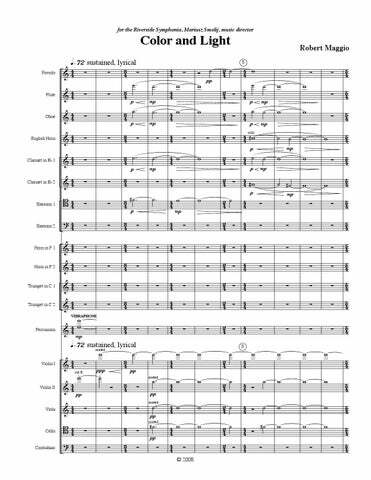 for Orchestra 12:00 2(Picc ) 2 2 2 – 4 3 3 1; Timp. 2Perc. Str. Movement I from “Three Paintings from DOS VISIONES” 7:30 3(Picc.) 3(E.H.) 3(B.Cl.) 3(Cbsn.) – 4 3 3 1; Timp. 3Perc. Pno. Hp. Str. 21:00 3(Picc.) 3(E.H.) 3(B.Cl.) 3(Cbsn.) – 4 3 3 1; Timp. 3Perc. Pno. Hp. Str. Maggio’s music has real virtues: a light, active sense of texture, a good nose for drama, and a sophisticated but readily approachable tonal language. …the most ambitious…and was received with enthusiasm…Maggio’s score was the most dynamic and effective. It is a very fine piece, colorful and expressive. It easily stands alone as a musical experience, without the choreography. A very important release from a young composer who bears watching. His compositional vocabulary is wondrously eclectic, allwoing him to say exactly what he wished to express here. …an impressive orchestral essay based on the Oscar Wilde novel. Invention is rife here, with its contrast of youthful elation (gleefully intoned by the clarinet) and the cynicism of age (shards of sound at the end.). …imaginative and vibrant… Its orchestration… proved striking. … an attractive work of passionate power and surpassing grace… it was the music that mattered: rich, inviting, rhythmically intriguing music that expressed the passions of two cultures and celebrated two rich and diverse kinds of music. …[Maggio has written] genuinely effective passages in this interesting work, particularly the intense finale, and the earlier meditative and finely nuanced musings… A real challenge, therefore, which at seven minutes duration does not outstay its welcome. …its rhapsodic, constantly fluctuating melodies, rhythms and meters impart a feeling of improvisation and spontaneity. In the hands of a capable soloist, Maggio’s piece will be a work of power and expressivity. Just as a cloud-streaked sky or gauze curtains fluttering in a window can unfetter the mind, these episodes proved capable of inducing a deep reverie. Maggio’s music, at its best, is deep and inspired. …imaginative, whimsical, surprising and successful. Maggio handles the orchestra with genuine flair, and the interactions of the brass and percussion sections give Imaginary Dances a certain punchy energy. …a jazz-inflected work of solidly idiomatic keyboard writing. …four well-known old tunes that were favorites of his adopted daughter. The tunes…are surrounded with concepts that contribute to several moments of real emotional meaning…Thanks, Robert, I think you have something special there. This was no calming Buddhist ‘Ohm’ evocation. For Maggio, the inward search of Daphne and by extension the audience, is scary, filled with eerie night-music, whispers and whimpers. Maggio’s music speaks directly in a comprehensible language of dark-hued colors which often touch the heart. The real find on the disc is the young Philadelphia composer Robert Maggio’s Desire-Movement… This is a composer whose career merits close attention. …a now turbulent, now serene work, pits bright soaring flights of flutes against the dusky, brusque rumbling of cellos before joining their voices in empathy. The piece explores dualities of mind and of heart, while also probing the special dualities inherent in its unique instrumentation. Two Quartets is memorable for, among other things, the soaring flute and cello pyrotechnics and for the lovely way instruments blend to achieve a wide range of effects. …casual quasi-tonalities and loping lines. …lyrical, passionate, melodic, and rhythmically charged… a young composer who bears watching.